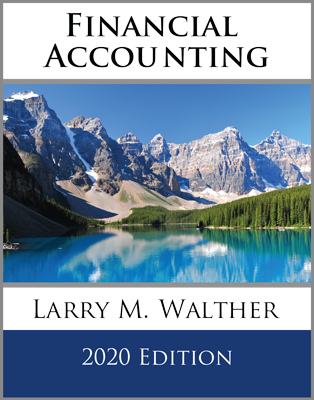 Spend just a few moments reviewing the preceding balance sheet, statement of retained earnings, and income statement for Emerson Corporation. Then, examine the following statement of cash flows. 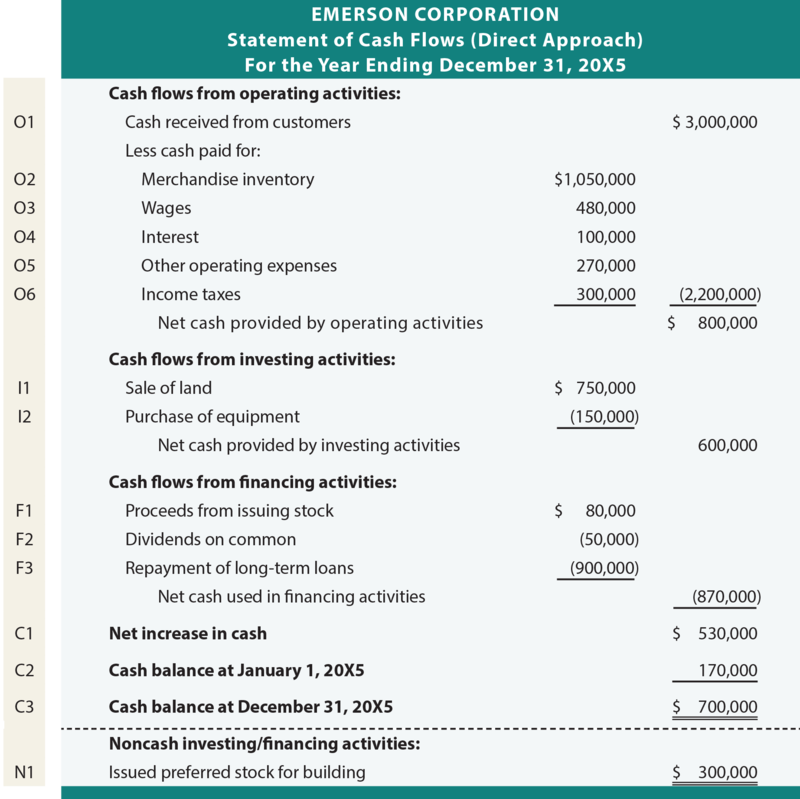 Everything within this cash flow statement is derived from the data and additional comments presented for Emerson. The tan bar on the left is not part of the statement; it is to facilitate the “line by line” explanation that follows. Accounts receivable increased by $250,000 during the year ($850,000 – $600,000). This means that of the total sales of $3,250,000, a net $250,000 went uncollected. Thus, cash received from customers was $3,000,000. If net receivables had decreased, cash collected would have exceeded sales. Emerson paid $1,050,000 of cash for inventory. Bear in mind that cost of goods sold is the dollar amount of inventory sold. But, the amount of inventory actually purchased will be less than this amount if inventory on the balance sheet decreased. This would mean that some of the cost of goods sold came from existing stock on hand rather than having all been purchased during the year. On the other hand, purchases would be greater than cost of goods sold if inventory increased. Emerson not only paid out enough cash to cover wages expense, but an additional $30,000 as reflected by the overall decrease in wages payable. If wages payable had increased, the cash paid would have been less than wages expense. Emerson’s cash payments for these items equaled the amount of expense in the income statement. Had there been related balance sheet accounts (e.g., interest payable, taxes payable, etc. ), then the expense amounts would need to be adjusted in a manner similar to that illustrated for wages. The gain on sale of land in the income statement does not appear in the operating cash flows section. While the land sale may have produced cash, the entire proceeds will be listed in the investing activities section; it is a “nonoperating” item. But, it is not necessary to refer to the journal. Notice that land on the balance sheet decreased by $600,000 ($1,400,000 – $800,000), and that the income statement included a $150,000 gain. Applying a little “forensic” accounting allows one to deduce that $600,000 in land was sold for $750,000, to produce the $150,000 gain. Emerson purchased equipment for $150,000 during the year. Notice that equipment on the balance sheet increased by $150,000 ($1,050,000 – $900,000). One could confirm that this was a cash purchase by reference to the journal; such is assumed in this case. This line reveals that $80,000 was received from issuing common stock. This cash inflow is suggested by the $10,000 increase in common stock ($910,000 – $900,000) and $70,000 increase in additional paid-in capital ($370,000 – $300,000). The statement of retained earnings reveals that Emerson declared $50,000 in dividends. Since there is no dividend payable on the balance sheet, one can assume that all of the dividends were paid. The balance sheet reveals a $900,000 decrease in long-term debt ($1,800,000 – $900,000). This represented a significant use of cash. Emerson had a $530,000 increase in cash during the year ($800,000 from positive operating cash flow, $600,000 from positive investing cash flow, and $870,000 from negative financing cash flow). This change in cash is confirmed by reference to the beginning and ending cash balances. The noncash investing and financing section reports that preferred stock was issued for a building. The statement of cash flows just presented is known as the direct approach. It is so named because the cash items entering into the determination of operating cash flow are specifically identified. In many respects, this presentation of operating cash flows resembles a cash basis income statement. Depreciation is added back to net income, because it reduced income but did not consume any cash. Gain on sale of land is subtracted, because it increased income, but is not related to operations (remember, it is an investing item and the “gain” is not the sales price). Increase in accounts receivable is subtracted, because it represents uncollected sales included in income. Decrease in inventory is added, because it represents cost of sales from existing inventory (not a new cash purchase). Increase in accounts payable is added, because it represents expenses not paid. Decrease in wages payable is subtracted, because it represents a cash payment for something expensed in an earlier period. This can become rather confusing. Most can probably see why depreciation is added back. But, the gain may be fuzzy. It must be subtracted because one is trying to remove it from the operating number; it increased net income, but it is viewed as something other than operating, and that is why it is backed out. Conversely, a loss on such a transaction would be added. Remember, the full proceeds of an asset sale are reported within investing activities, regardless of whether the sale produced a gain or loss. Be able to calculate cash received from customers. Be able to calculate cash payments for merchandise. 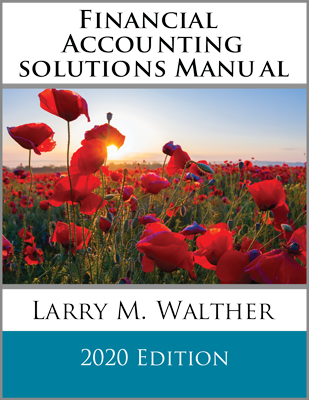 Be able to calculate cash payments for selling and administrative expenses, and cash payments for interest and income taxes. What items found on an income statement tend to be ignored in the preparation of a statement of cash flows? Know what is typically included in the investing and financing activities section of a statement of cash flows. 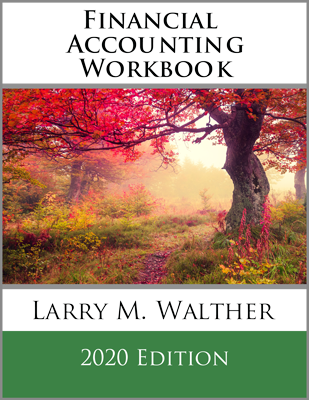 Be able to reconcile net income to cash flows from operating activities. Know how to prepare a statement of cash flows under the direct approach.